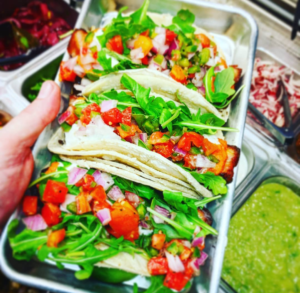 The Screaming Goat Taqueria offers a wide range of catering options, hence our services are a great fit to any need. Whether you are having a business meeting, and need a power lunch, or want to surprise someone with a party that is completely out of the ordinary, as a result our catering will make you look like a hero. 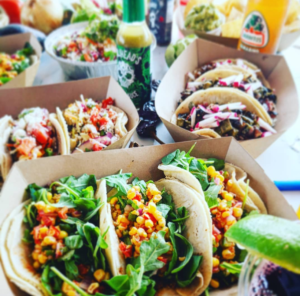 In addition to catering our Street Tacos, we offer a variety of Latin Street Food that is not only healthy, but most noteworthy, delicious. Creative vegan / vegetarian selections are one of the aspects of our menu that we are probably best known for catering. With the exception of our burritos, everything on our menu is 100% Gluten-Free. Finally, because we make all of our food completely from scratch, we have the ability to work with nearly any special diet that we cater. Click Here For A Copy of Our Most Popular Party Menu! In addition to our catering packages, we also offer all of our menu items individually. Click Here For An A la Carte Menu. Email Malin@Screaming-Goat.com To Book Your Party Today! 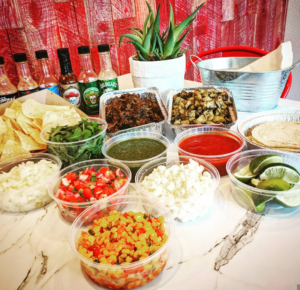 Let your guests mix and match ingredients to make the perfect custom taco or bowl!